I can’t believe it has taken me so long to make my own homemade Monte Carlo Biscuits!! 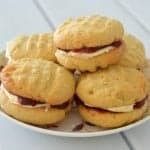 I’m a sucker for a cream filled biscuit, but have always been a little scared to try making them myself as I thought it would be all too hard. 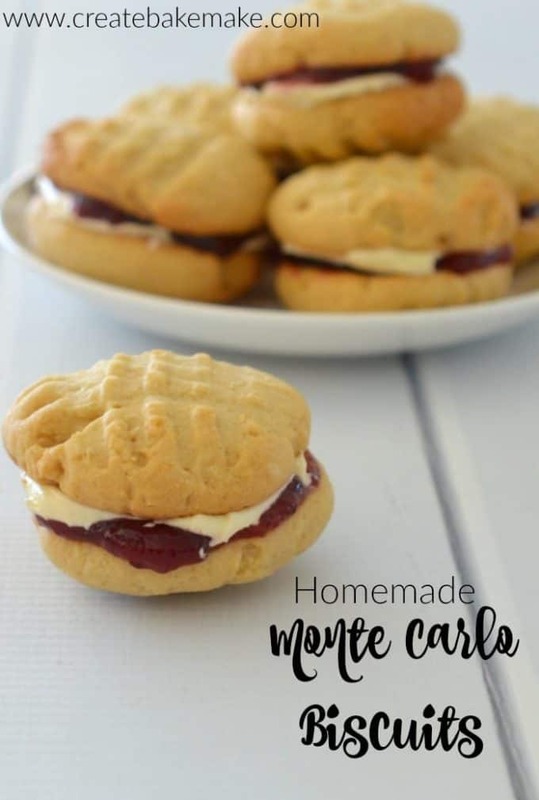 A couple of weeks ago I decided to finally take the plunge and have a go at making one of my favourites – Monte Carlo Biscuits. I seriously can’t believe it’s taken me so long to make these myself, they are SUPER easy to make and I really think they taste better than the store bought ones – a big call I know! So I didn’t get distracted, I started making these while the boys were outside playing, however they soon worked out what I was doing and came racing inside to ‘help’. Thankfully the biscuits were out of the oven and cooling down by this stage, so they each got the job of helping to add the filling to each biscuit, one was in charge of the jam and the other the buttercream which thankfully avoided any arguments over who got to do what. 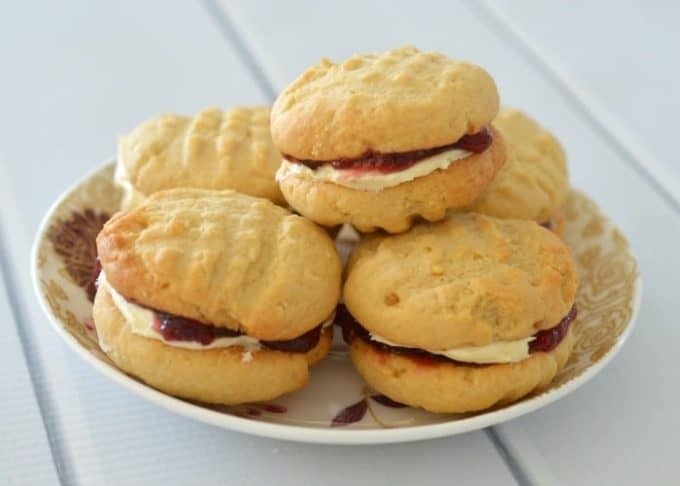 It took every ounce of my self control to stop myself from eating one of these amazing biscuits, and I had to put the biscuit tin high up in the pantry where it was safe from little hands as both of the boys LOVED them. 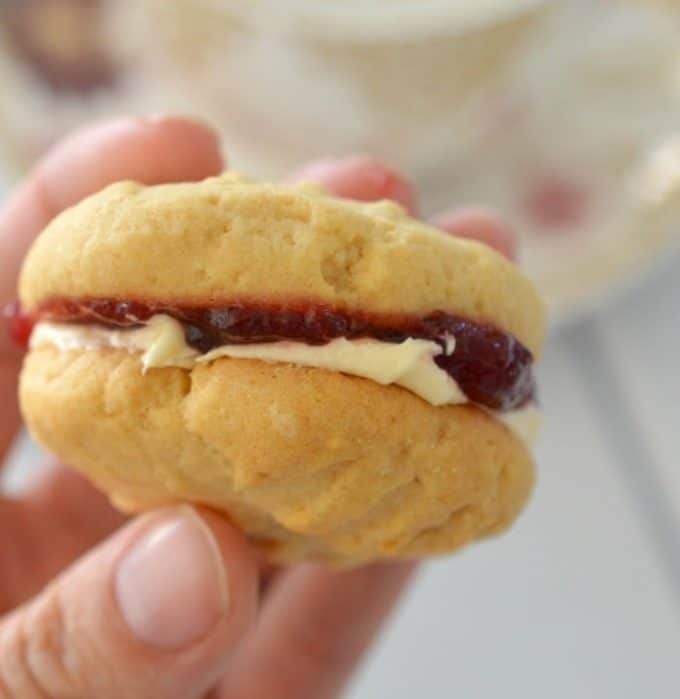 I don’t think there is going to be any stopping me now from making filled biscuits, I just need to decide whether to try making Shortbread Creams or Kingston biscuits next! Place 125g of softened butter along with the brown sugar into the bowl of an electric mixture and beat for approximately 8 minutes until pale and smooth. Add 1 teaspoon of vanilla extract and the egg and mix to combine. Add the self raising flour, plain flour and desiccated coconut and mix on a low speed until just combined. Use a tablespoon to scoop up the mixture and gently roll into little balls before placing on the baking trays. Repeat until you have used all of the mixture. Gently press down on the top of the balls with the back of a fork to flatten, before placing the baking trays into the oven to bake for 10 - 12 minutes. Let the Monte Carlo Biscuits cool on the baking trays for 10 minutes before carefully transferring to a wire rack to cool completely. To make the buttercream filling, place 60g of softened butter, 1/2 teaspoon of vanilla extract and the icing sugar mixture into the bowl of an electric mixer and beat for 3 -4 minutes or until pale and combined. Place 125g of softened butter the brown sugar into your Thermomix bowl (with the butterfly attached) and mix for 30 seconds on speed 3 to combine. Scrape down the sides and mix for a further 20 seconds on speed 3 or until pale and creamy. Add 1 teaspoon of vanilla extract and the egg to your Thermomix bowl and mix for 10 seconds on speed 3. REMOVE THE BUTTERFLY ATTACHMENT and add the self raising flour, flour and desiccated coconut to your Thermomix bowl and mix for 30 seconds using the ‘kneading’ function. Gently press down on the top of the balls with the back of a fork to flatten, before placing the baking trays into the oven to bake for 10 – 12 minutes. To make the buttercream filling, place 60g of softened butter, 1/2 teaspoon of vanilla extract and the icing sugar mixture into a clean Thermomix bowl with the butterfly attached and mix for 30 seconds on speed 3. Scrape down the sides and mix for a further 10 seconds speed 3 or until the buttercream is pale and creamy. 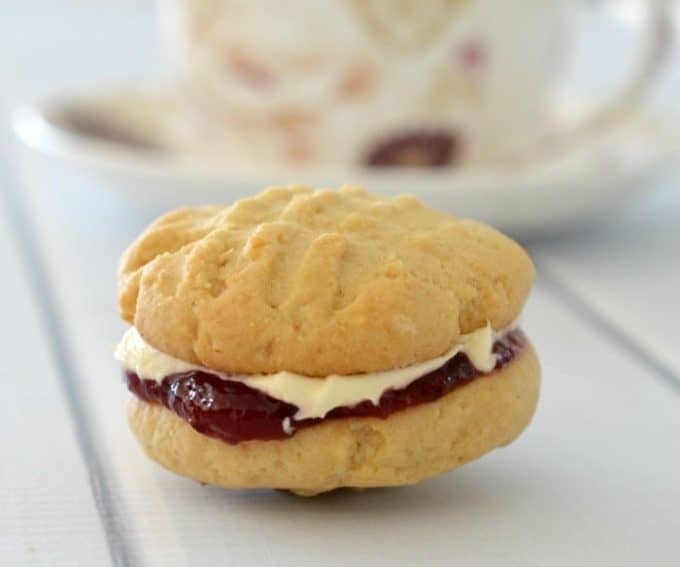 What’s your favourite bought biscuit? Have you tried making it at home? I have a feeling her new book will be as loved as yours. It really very nice,Thankful for sharing. Yes!!! Thank you so much! I tried this last night and it was delish! My husband really enjoyed it and that’s quite rare. The dishes were actually minimal which I loved, some one pot recipes are a massive mess to get to the one pot part. Thanks again! Would like to make this, can i use all purpose flour only? In france this all i can find. I have just discovered your blog recently and love the look of your recipes.This looks delicious! !well it just looks damn incredible!! Thanks for sharing. So enjoyed making the Monte Carlo Biscuits. It is the second time I have followed your recipe and they are just delicious.They didn’t last long in our house. a real classic and infinitely better than store bought.